Renewed interest in the role of native legumes in cattle production has been prompted by an increased awareness of the different species in native pastures. Information on the productivity and quality of native legumes is scant, but some general observations can be made. Healthy, productive native pastures generally contain a diverse range of species including many native legumes. A range of species that have particular adaptations for different soil types and growing at different times of the year contribute to providing an even ‘feed year’ for grazing cattle. One species may grow mainly in the spring while another is more vigorous and selected by cattle in late summer and autumn. Having a variety of species allows cattle the best diet selection over a longer period of time. Native pasture communities, managed to give species diversity, can contain six to ten or more herbaceous native legumes. Many of these are nutritious and are actively selected by grazing cattle. Although an individual legume species may not be highly productive and contributes only a small amount to the bulk of pasture, collectively, the more palatable species may contribute significantly to the diet of grazing cattle. They may just give the ‘icing on the cake’ in terms of cattle production. 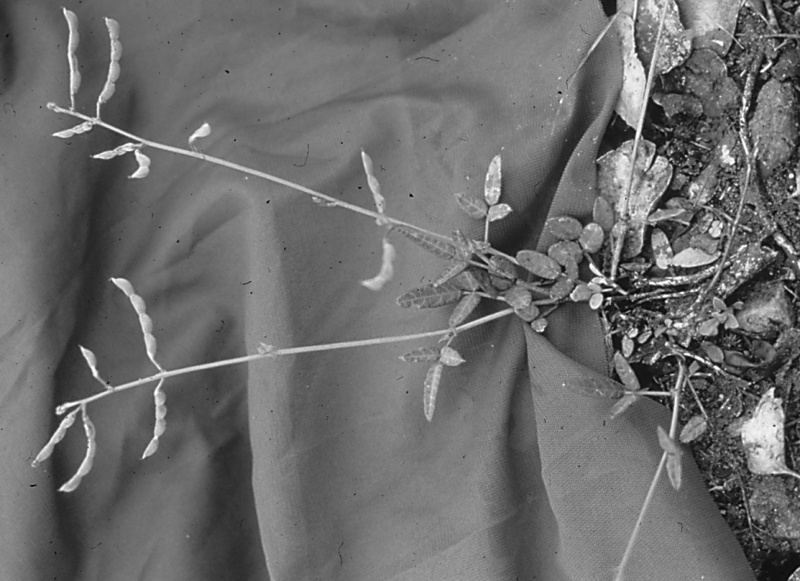 Some of the native herbaceous legumes, such as the rattlepods, are poisonous. However, provided stocking pressure isn’t too high and an adequate selection of forage is available, stock will generally avoid the toxic plants. Managing pastures to maintain a strong presence of native legumes can enhance cattle production and ensure the health and productivity of the landscape is maintained. 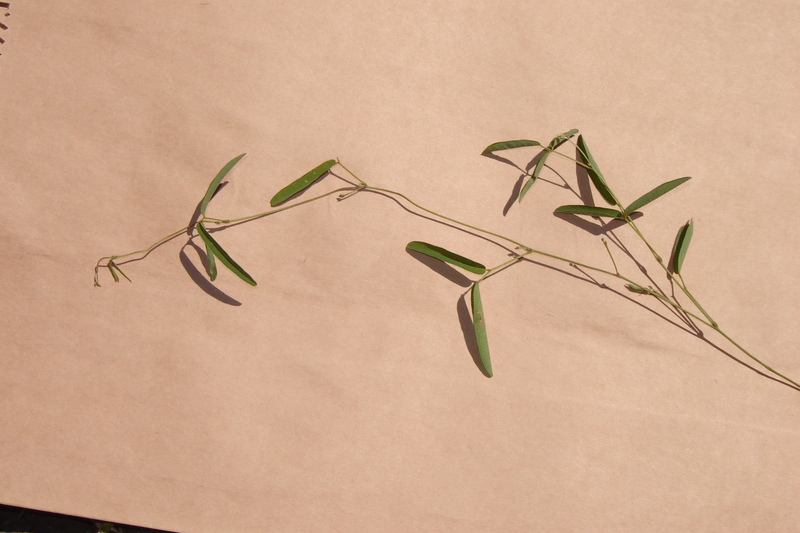 Glycines are trailing or climbing, perennial legumes with stems to 2m long. Their leaves are made up of three leaflets. They have small, purple, pea-shaped flowers and slender, slightly flattened, bean-like pods. Flowers may occur in elongated groups on erect stalks or singly in the junction of the leaf and stem. Glycines grow and flower during the warmer months. 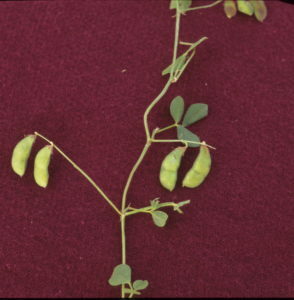 Glycine pea leaves are generally hairless and are longer and narrower than the leaves of woolly glycine. 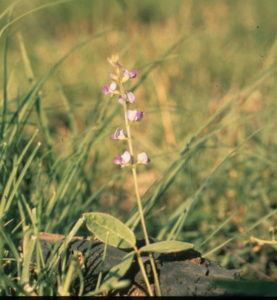 Woolly glycine has a covering of rusty-brown hairs on all parts of the plant. Found on a wide range of land types, but common on the sandier, duplex soils in box, narrow-leaved and silver-leaved ironbark country. 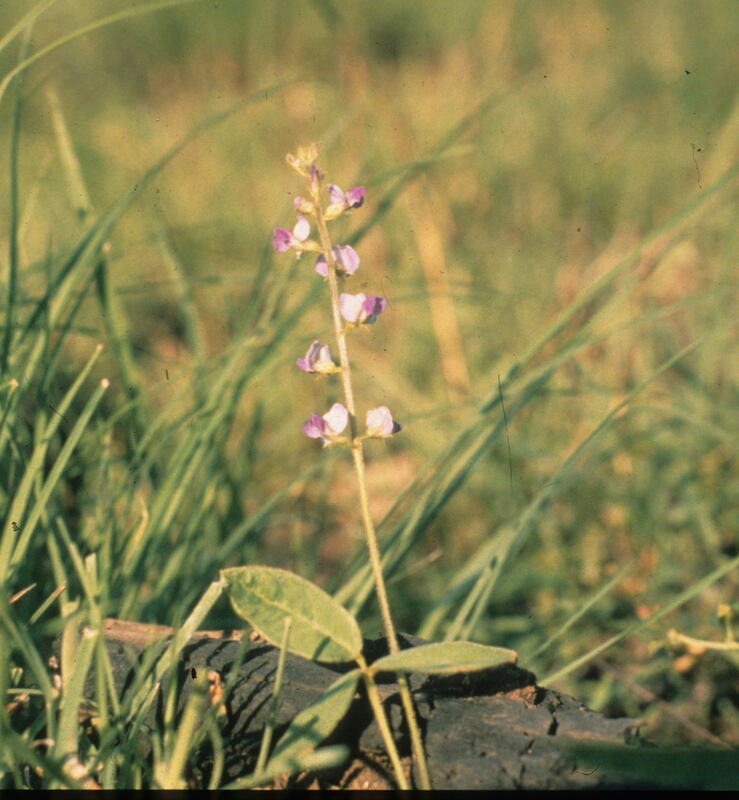 Woolly glycine prefers sandy soils, while glycine pea prefers clay soils. The glycines occur as scattered plants in many native pastures and have a higher protein content than many other pasture forages. They can survive light grazing and are palatable and nutritious for stock. They rarely form a high proportion of the pasture. A trailing, perennial legume that grows to 2m long. It has brown stems and leaves made up of three roundish leaflets. The yellow, pea-like flowers are widely arranged on an erect stalk. The flattened seed pods are covered with sticky hairs and contain one or two smooth, freckled seeds. Rhynchosia flowers in spring and summer. Found in blue gum and silver-leaved ironbark country on cracking clay soils. It is also often found on heavy soils of other land types, particularly on fertile sites, along watercourses and beneath large trees. Rhynchosia often loses its leaves in winter, but makes good growth with favourable summer rains. 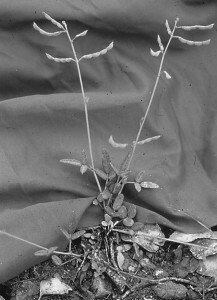 Individual plants only survive for two to three years. Although seldom abundant in a pasture, rhynchosia is moderately palatable. It can become a significant component of pastures that are frequently rested from grazing during the growing season. It is reported to be more salt-tolerant than most herbaceous legumes. A small, perennial legume with a strong taproot, dark-green leaflets and inconspicuous, pale-cream or pale-pink pea-shaped flowers. 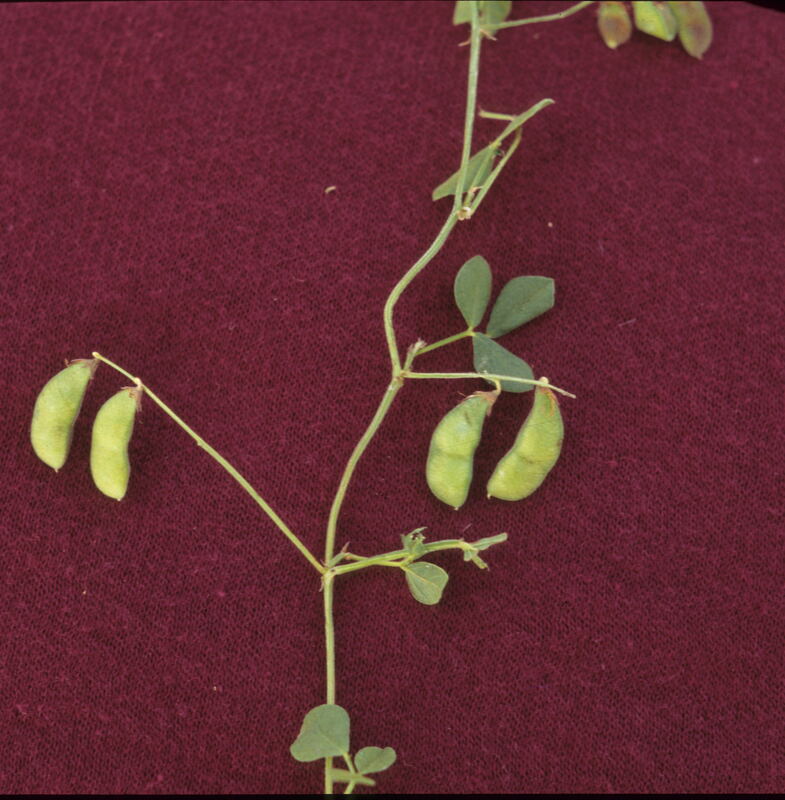 The green seed pods are the distinguishing feature of the plant and are 2–4cm long. They are covered in small, hooked hairs and are segmented with a smooth, downward curved upper edge and a scalloped lower edge. Slender tick trefoil is most obvious in good summers and after fire. Occurs on clay soils in box, ironbark, brigalow and blue gum. Once seedlings establish a good taproot, the plant is very resistant to grazing. It will readily re-sprout from the taproot if defoliated or burnt. It is rarely abundant in grazed pastures as it is readily eaten by stock. Trailing perennial legume, (sometimes a small woody shrub) to 30cm high with hairless trailing stems up to 1m long. Leaves branch twice between the stem and individual leaflets. They are sensitive to touch and close when touched. Flowers are loosely clustered into small, 1cm diameter, pale-yellow, globular heads at the end of a stalk 4–13cm long. They ripen into bundles of three to ten, flat, brown pods, 2–3cm long and 8–10mm wide, with 8 seeds to each. Grows mainly on clay and loamy soils in silver-leaved ironbark, blue gum and box country. Common and widespread, not as palatable as some other species but is grazed. The photos and descriptions in this article are taken from the Department of Agriculture and Fisheries publication ‘Pasture plants of southern inland Queensland’. by D.R. Henry et al, published in 1995. This book has excellent photographs and will help you to become more familiar with the plants in the field.